Diamond-like carbon or commonly known as DLC, includes carbon items with sp3 bonding. It contains various useful properties including chemical inertness, mechanical hardness, and optical transparency. DLC is gaining the attention of various industries due to its widely applicable properties and continues to attract investments worldwide through research. Currently it is in heavy demand for razor blades, magnetic hard disks, invasive and implantable medical devices, scratch-resistant glasses, and mechanical face seals. DLC includes various chemical elements such as hydrogen, sulphur, silicon, fluorine and titanium. This makes it an essential ingredient in manufacturing for a wide variety of applications. DLC’s micro-structures make up for its tribological properties. These micro-structures include the volume of hydrogen present, and sp2 to sp3 carbon atoms ratio. There are two main types of DLCs in the market. These two types are pure DLC and mixed DLC. 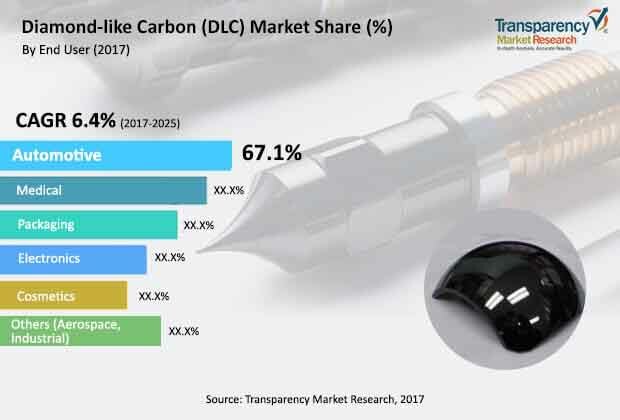 The global diamond-like carbon market is expected to be driven by growing demand for the product in automotive engine components. DLC coatings serve a useful purpose in automotive tappets, differential gears, diesel fuel injectors, valve lifters, door hinges, and wrist pins. Friction can reduce the life of these important automotive components as well as reduce their usefulness with rusting. DLC coating provides an important protective shield and often provide appealing décor in a cost-effective manner. Additionally, DLC coating improves lubrication by reducing friction. Consequently, it improves the efficiency of vehicles for all stakeholders. Advancements in DLC coating including high abrasion resistance is expected to further boost the Diamond-like Carbon market during the forecast period. Due to DLC’s high biocompatibility, the demand for it is also high in the medical industry. It is expected to become a key factor for driving growth in the diamond-like carbon market. The DLC offers various benefits to the medical industry including low friction, bio-inert characteristics and, exceptional brittleness. These qualities help stop the leakage of metallic ions to body parts. Hence, DLC is extremely helpful in orthopedics surgeries as well as regular therapy. It also offers various benefits to cardiovascular treatments, guide wires, etc. These reasons are expected to help the diamond-like carbon market growth during the forecast period. Emission of carbon dioxide is reportedly a major reason for global warming. DLC coating involves the layer of carbon atoms. It can combine with oxygen and release carbon dioxide in the atmosphere. The stringent regulations governing the automotive industry and keeping carbon dioxide in check can hamper growth of the diamond-like carbon market. Lack of strong adhesive abilities of DLC can further contribute to the impact on the market in Europe and North America. Major players situated in these regions are investing in ultrathin layer coating technologies. Its growing advancement can bring good news for the market during the forecast period. Other highly advanced technique are also undergoing innovation in the diamond-like carbon market. These include plasma assisted chemical vapour deposition and pulsed laser deposition. Additionally, self-healing DLC, which manufactures ultra-thin film with high performance characteristics, is expected to boost the market growth further during the forecast period. Diamond-like carbon (DLC) is primarily employed in advanced coating applications due to its tribological properties such as high hardness, wear resistance, and abrasive power. Two major types of DLCs are available in the market: pure DLC and mixed DLC. DLCs are largely used in automotive and medical end-use industries. DLC based materials with special wettability have been successfully employed in the development of superhydrophilic and superhydrophobic surfaces. This has led to improved performance as well as durability. DLCs are used to coat auto parts in the automotive industry, while they are used to coat surgical devices in the medical industry. Different types of DLC coatings are used to provide a wide range of mechanical properties. Tetrahedral amorphous carbon (ta-C) is the hardest, thin, and glossy form of DLC. Coatings based on DLC can be extremely hard and give low coefficients of friction. Properties of DLC can be evaluated by the nano-indentation method, scratch and wear, and friction testing. Advanced microscopic technologies such as scanning electron microscopy (SEM) and atomic force microscopy (AFM) can be employed for the evaluation of the mechanism of deformation. DLC coating can be produced through advanced deposition technologies such as PVD (Pulsed Vapor Deposition) and CVD (Chemical Vapor Deposition). These advanced technologies include sputtering, cathodic arc deposition, pulsed laser deposition, ion beam deposition, and plasma enhanced chemical vapor deposition. In terms of type, the global DLC market can be classified into pure DLC and mixed DLC. In terms of the commonly employed application, the global DLC market can be segmented into drill bits & milling cutters, saws & blades, dies & molds, inserts, and others (including hobs and broaches). Based on end-user, the global DLC market can be divided into automotive, packaging, medical, electronics, cosmetics, and others (including aerospace and industrial). Rise in demand for DLC coating in automotive engine components is a key factor driving the global DLC market. DLC coatings help increase the shelf life of automotive engine components by decreasing the coefficient of friction. Increase in demand for DLC coatings in the medical Industry is also a major factor boosting the DLC market due to the emerging demand in orthopedic, cardiovascular, and dental applications. DLC coatings are employed in orthopedic applications to reduce wear, corrosion, and debris formation. DLC coatings are primarily employed in the medical industry to coat biomedical devices, which are used in cardiovascular and orthopedic applications. Constant research activities in automotive, electronics, and medical industries is likely to create new opportunities for DLC manufacturers. According to the RoHS guidelines, medical device manufacturers are focusing on moving toward greener engineering technologies such as DLC coating materials, as these are biocompatible and can work in a wide range of temperatures. The report analyzes and forecasts the market for DLC at the global and regional level. The market has been forecast based on revenue (US$ Mn) from 2017 to 2025. The study includes drivers and restraints of the global DLC market. It also covers the impact of these drivers and restraints on demand for DLC during the forecast period. The report also highlights opportunities in the DLC market at the global and regional level. The report comprises a detailed value chain analysis, which provides a comprehensive view of the global DLC market. Porter’s Five Forces model for the DLC market has also been included to help understand the competitive landscape. The study encompasses market attractiveness analysis, wherein end-users are benchmarked based on their market size, growth rate, and general attractiveness. The study provides a decisive view of the global DLC market by segmenting it in terms of type, application, end-user, and region. These segments have been analyzed based on the present and future trends. Regional segmentation includes the current and forecast demand for DLC in North America, Europe, Asia Pacific, Latin America, and Middle East & Africa. The report also covers demand for individual end-user segments in all the regions. The study includes profiles of major companies operating in the global DLC market. Key players profiled in the global DLC market include Oerlikon Group, Morgan Advanced Materials Plc, Miba AG, Renishaw Advanced Materials Ltd, Acree Technologies Inc, and IBC Coatings Technologies, Inc. Market players have been profiled in terms of attributes such as company overview, business strategies, recent developments, and SWOT analysis. The report provides the estimated market size of DLC for 2016 and forecast for the next nine years. The global size of the DLC market has been provided in terms of revenue. Market numbers have been estimated based on type, application, end-user, and region. Market size and forecast for each major type, application, and end-user have been provided in terms of global and regional markets.